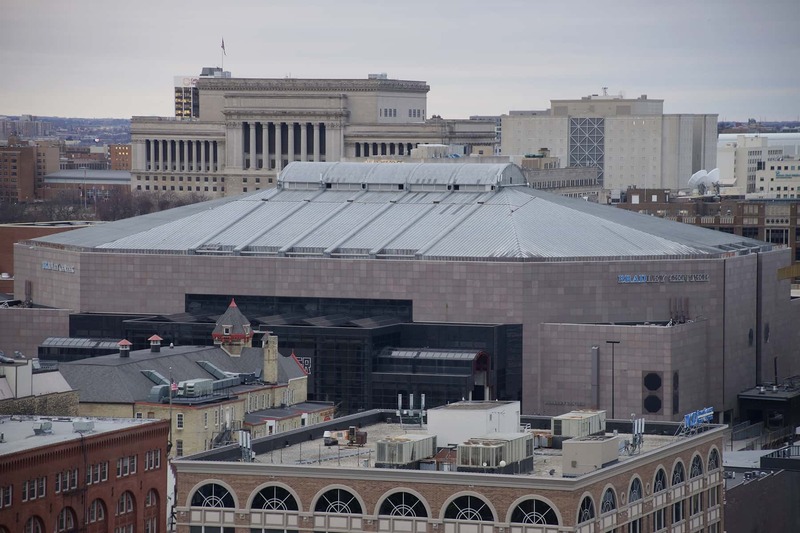 For 30 years, concert bands raised the roof at the Bradley Center. 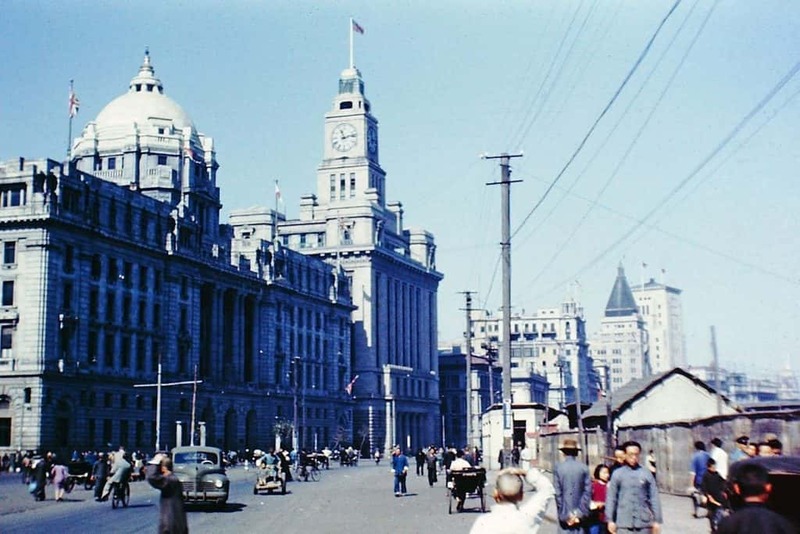 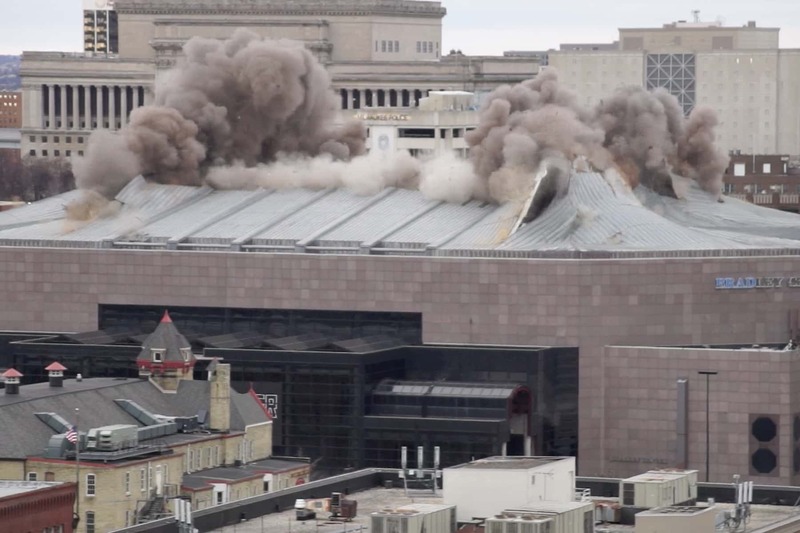 On January 13, demolition crews razed the roof in 30 seconds. 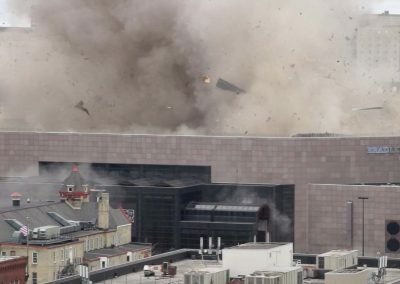 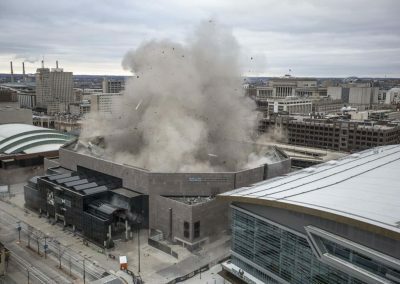 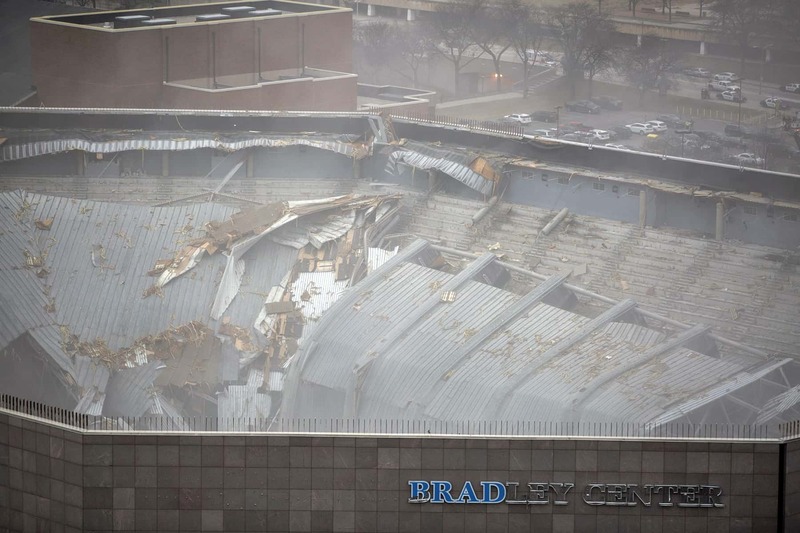 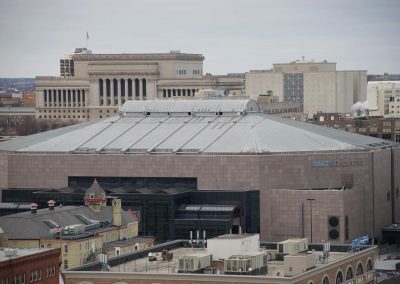 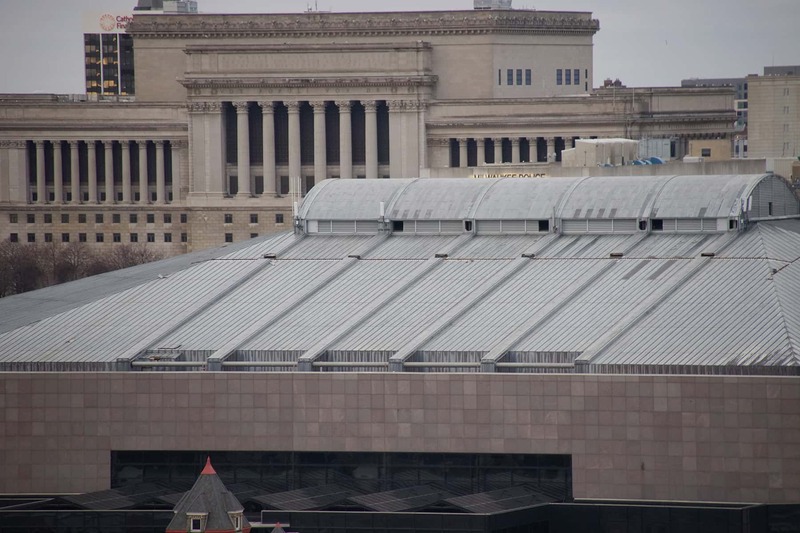 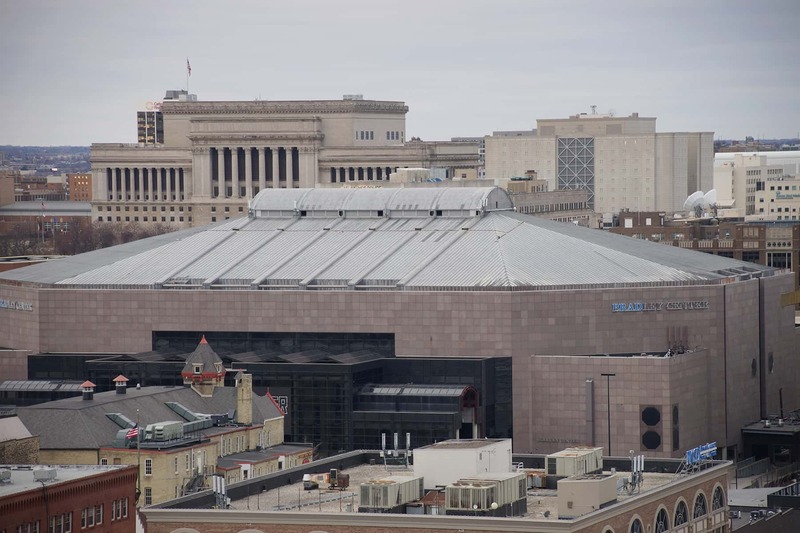 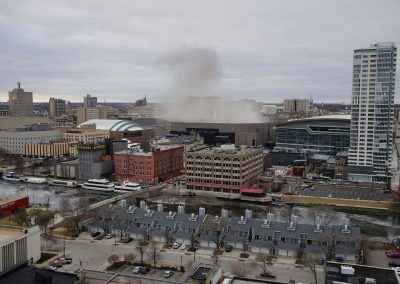 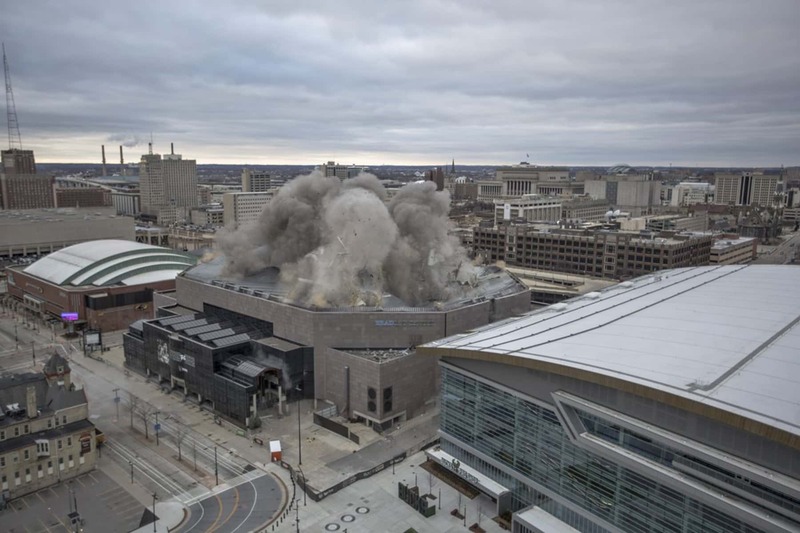 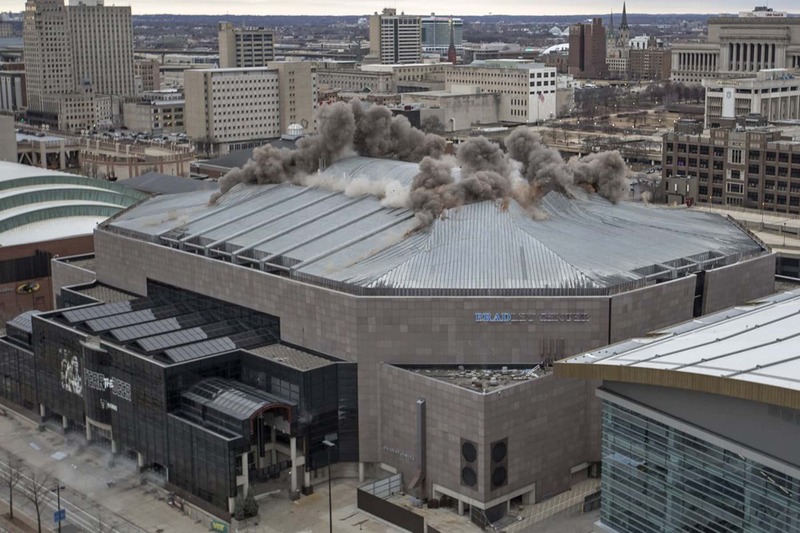 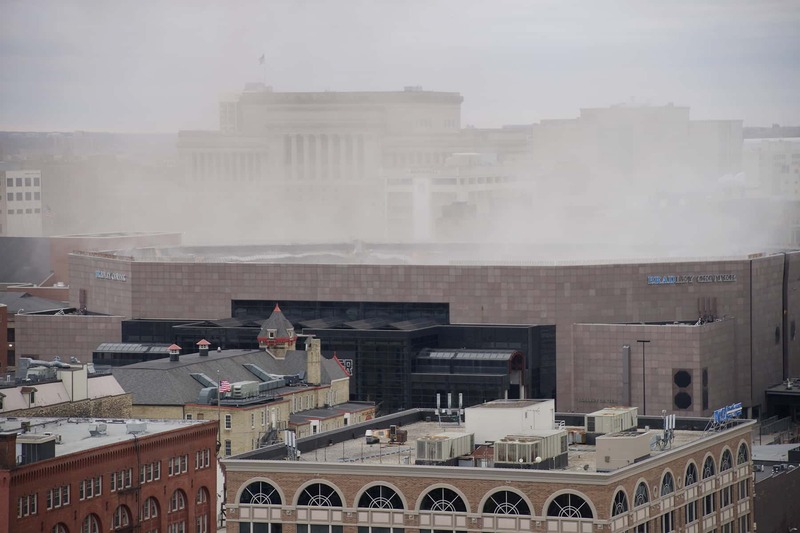 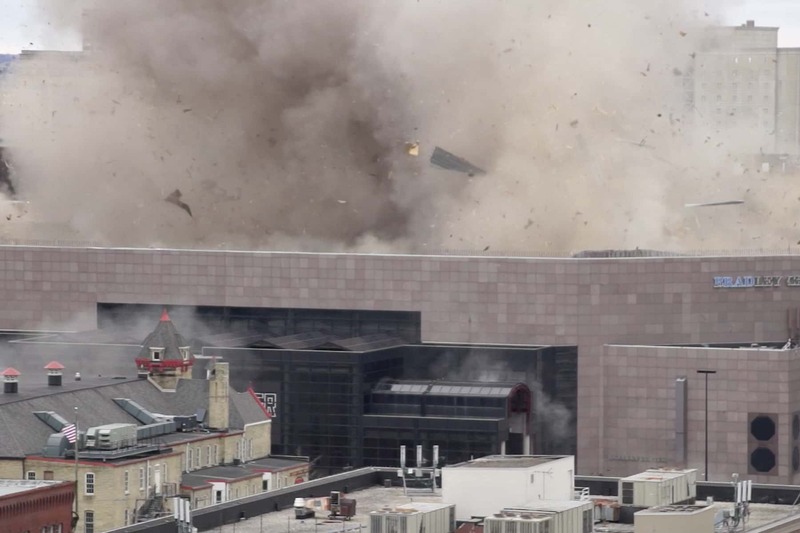 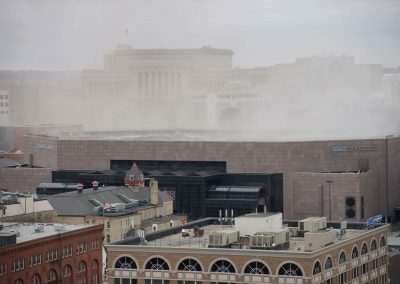 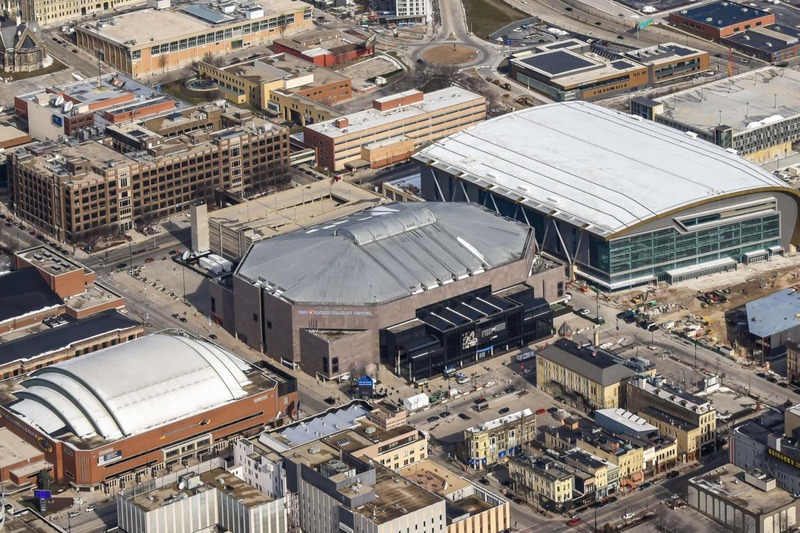 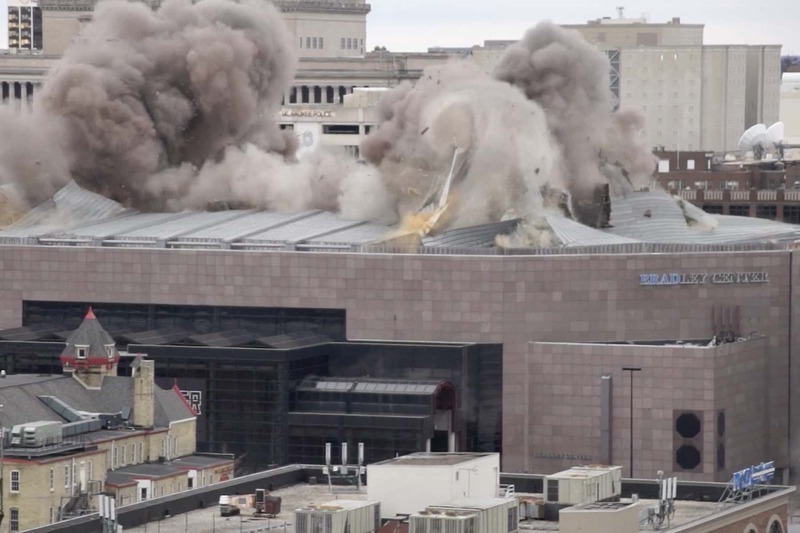 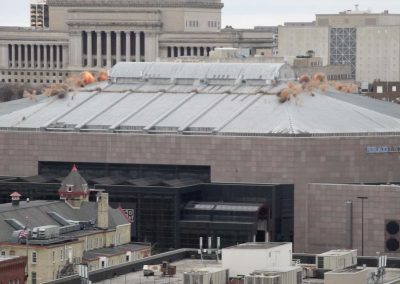 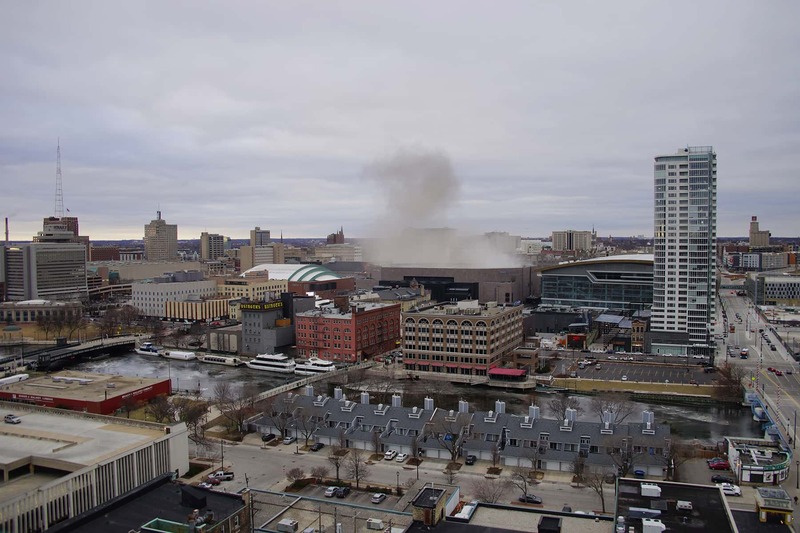 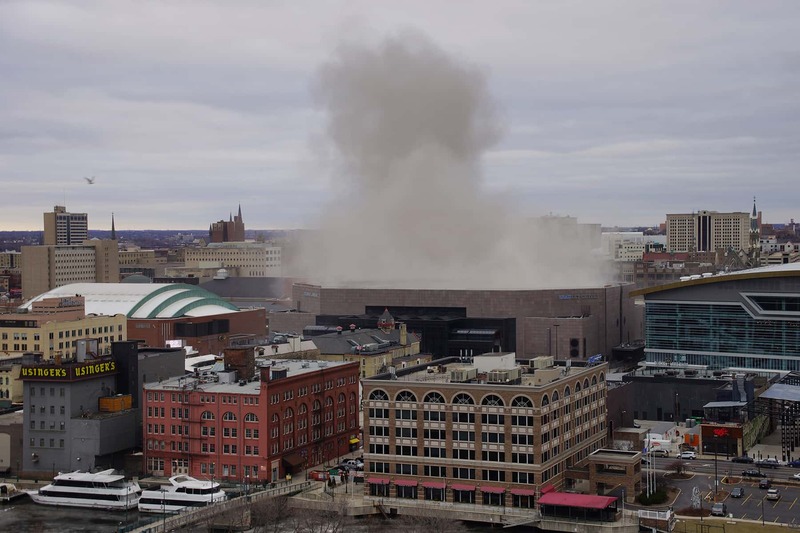 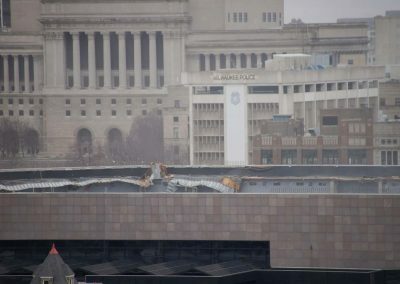 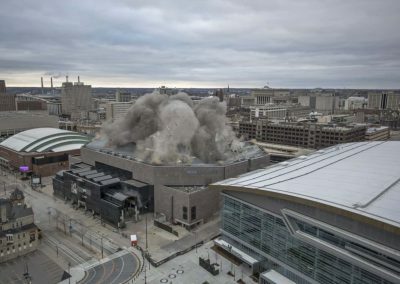 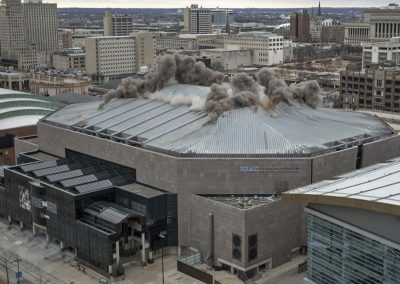 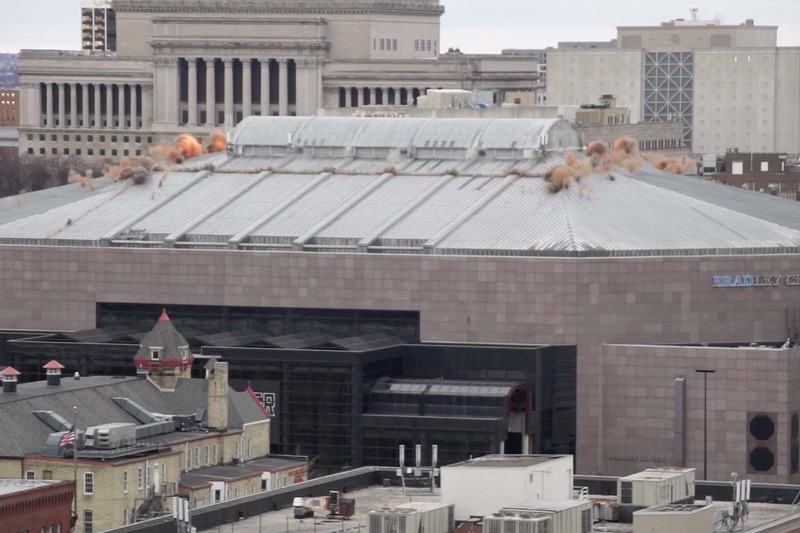 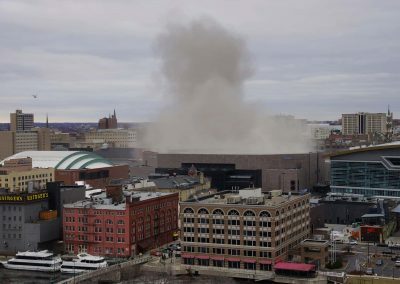 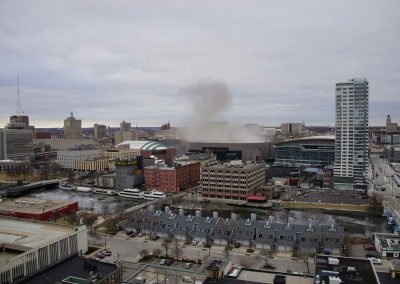 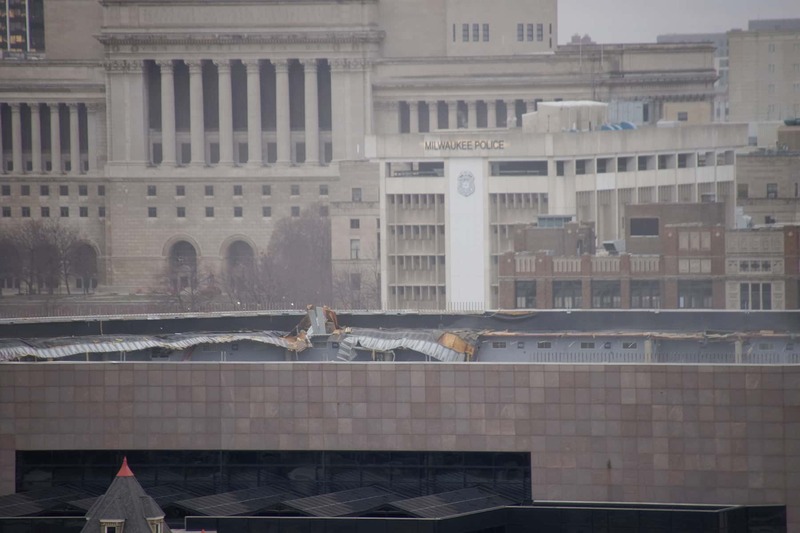 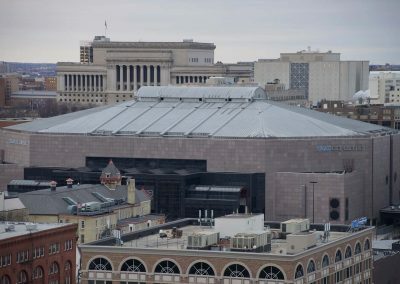 After slowing deconstructing the former home of the Milwaukee Bucks for the past few months, construction crews detonated shape charges in the Bradley Center’s roof at 9:02 a.m. and brought the superstructure crashing down. 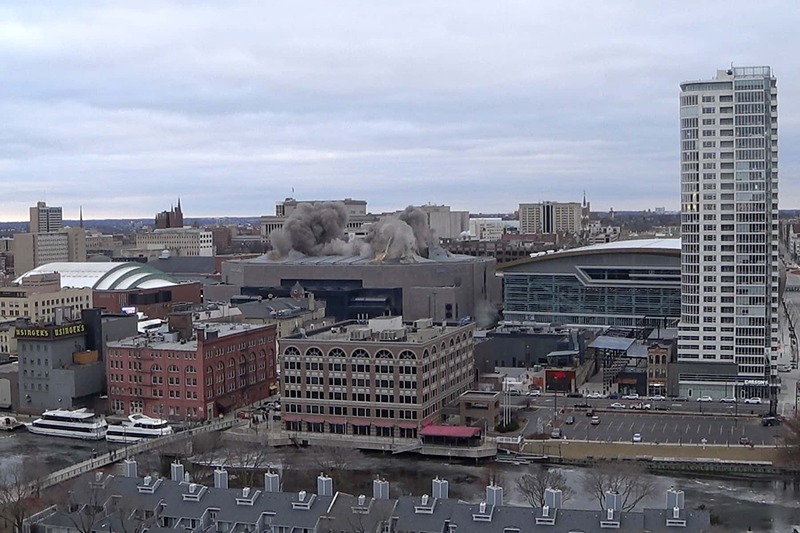 The resulting plume of debris rose to a height almost equal that of The Moderne tower across the street. 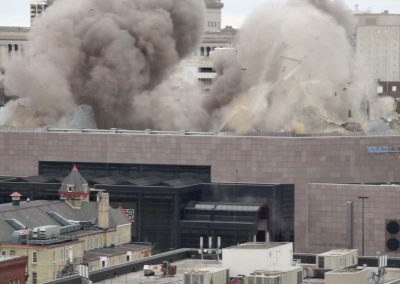 Crowds gathered at the edges of the safety areas and on rooftops with vantage points to watch the historic demolition in person. 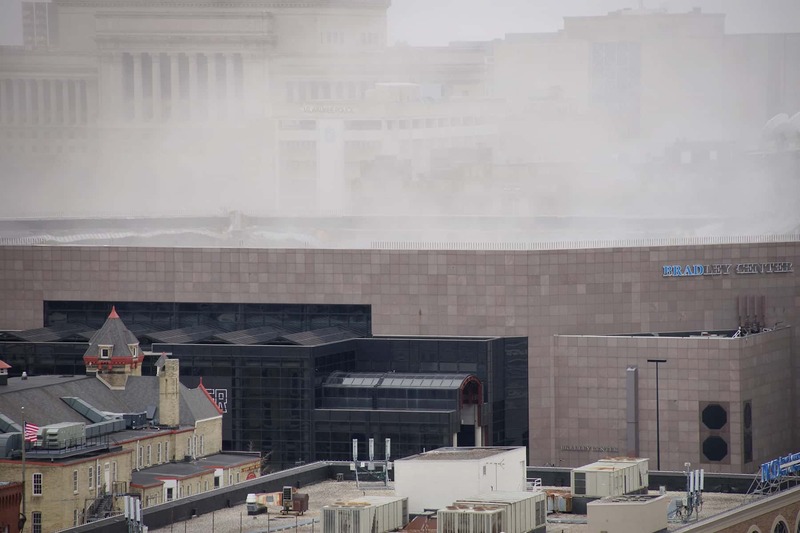 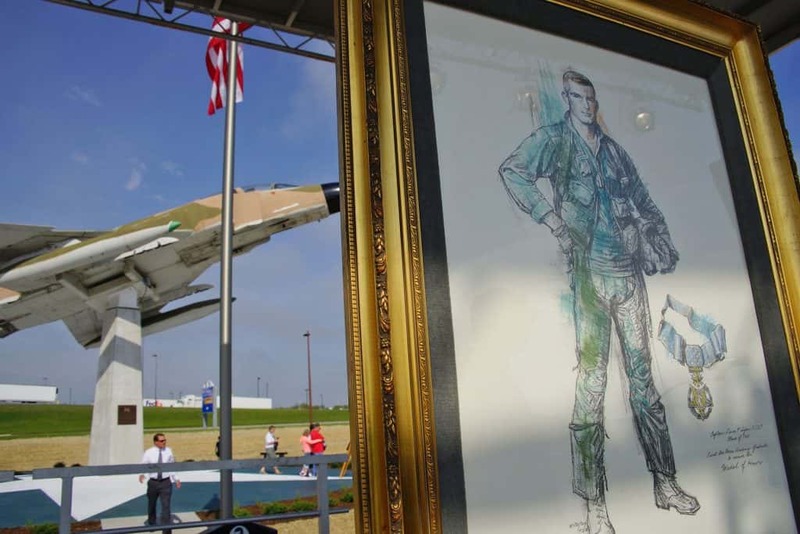 Social media was splashed with images taken all around the perimeter. 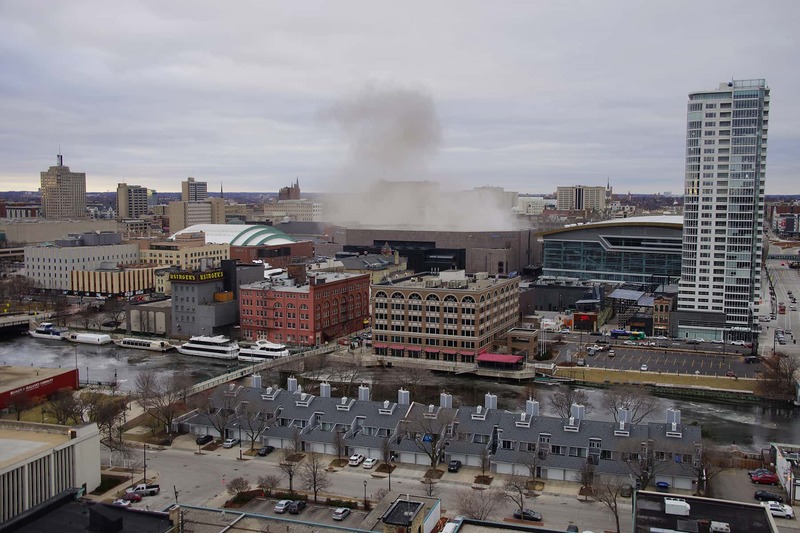 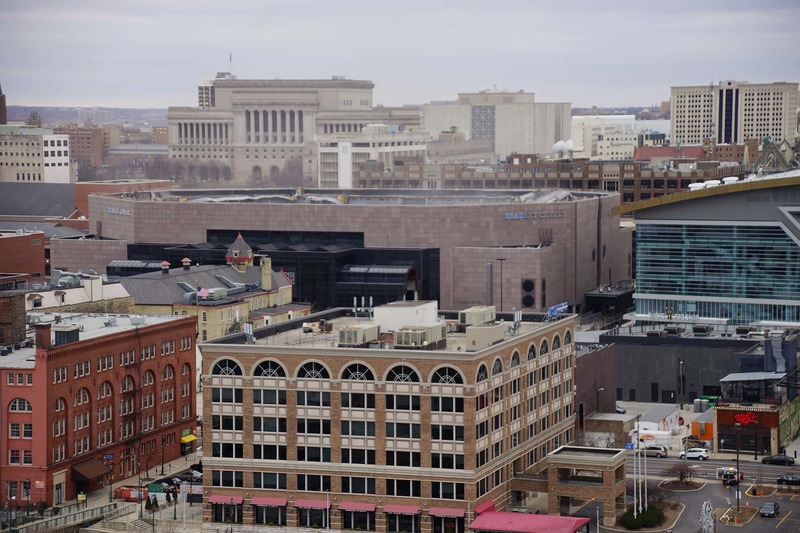 The roof implosion was rescheduled at the last minute from the original window of time, between 9:00 – 9:30 a.m. to an earlier 8:30 – 9:00 a.m.
Veit & Company performed the demolition work, under the supervision of Hunzinger Construction. 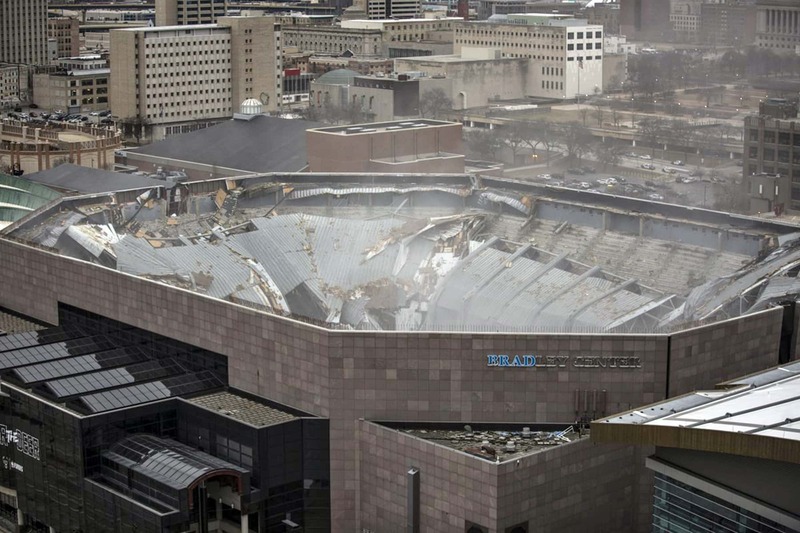 The demolition left the Bradley Center’s wall structure in tact. The roof was “lowered” by the explosives, to speed the deconstruction process and minimize risks to crews working on the project. 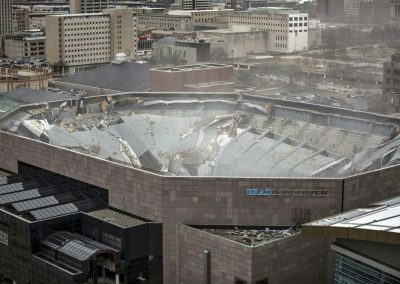 The 7.2-acre site is expected to be cleared by the summer, and lowering the roof was a major milestone in that removal process. 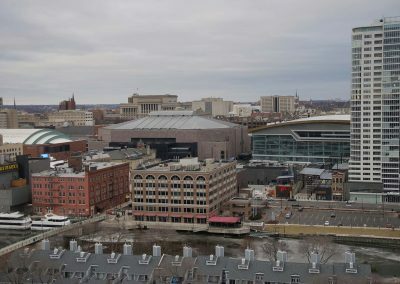 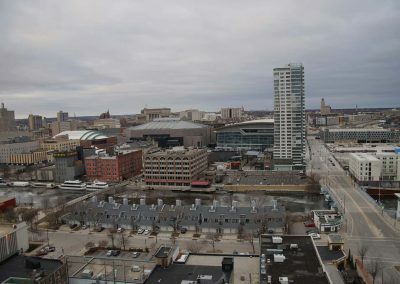 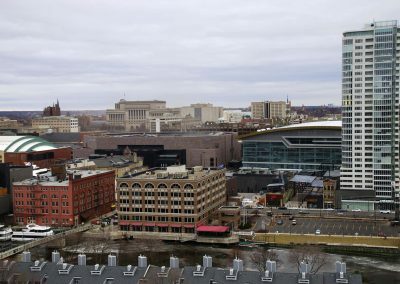 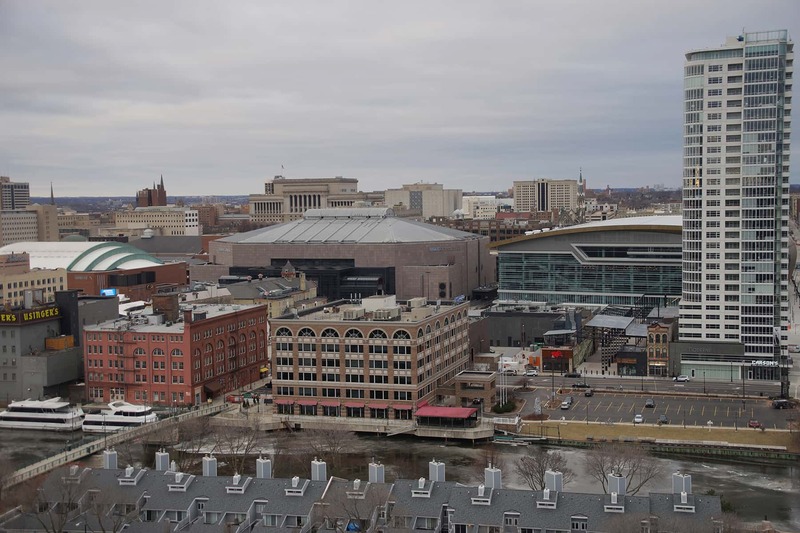 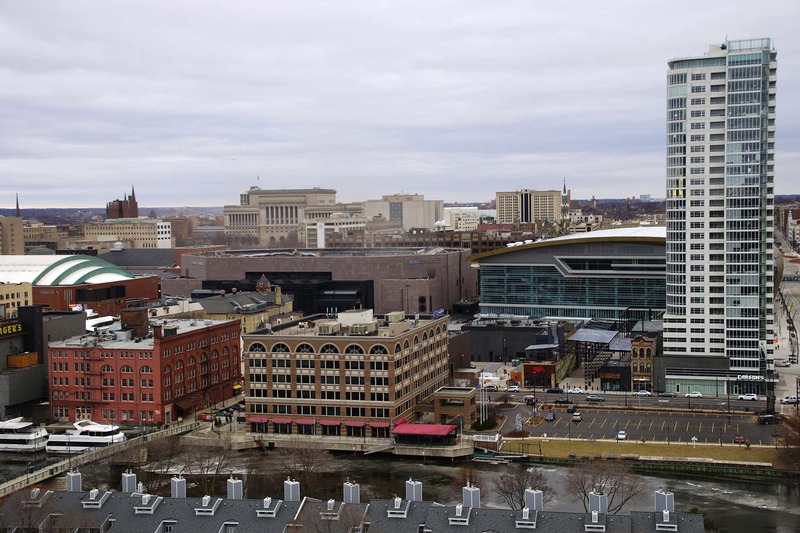 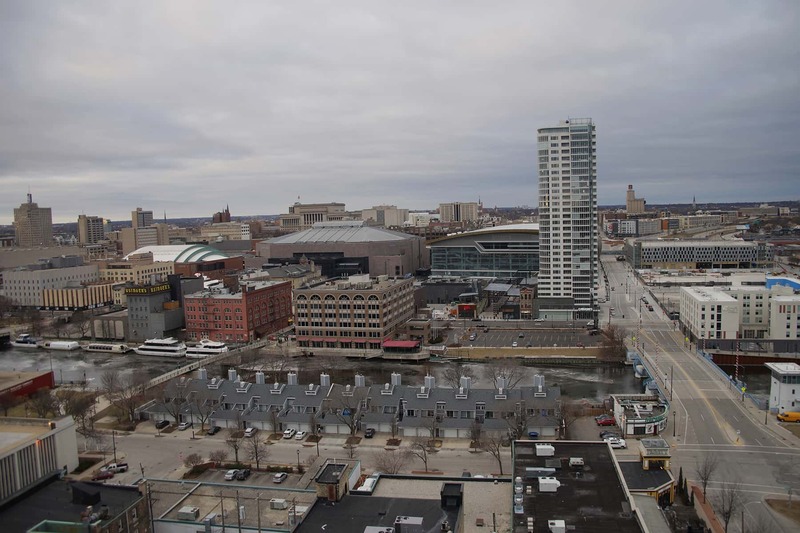 The Milwaukee Bucks own the prime real estate plot adjacent to the Fiserv Forum, but have not announced final plans for its development. 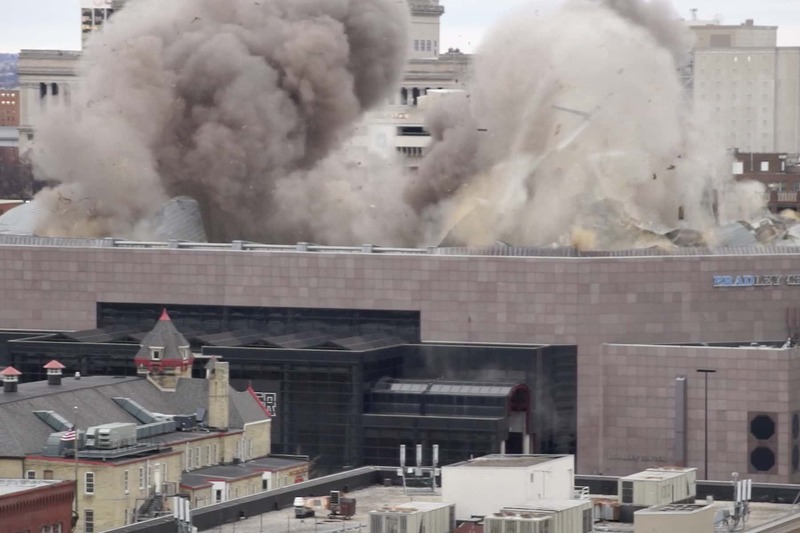 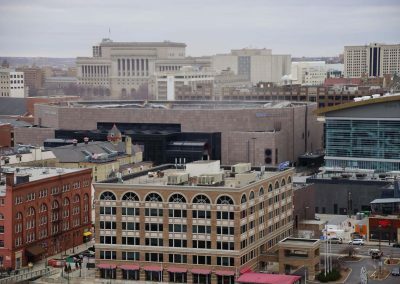 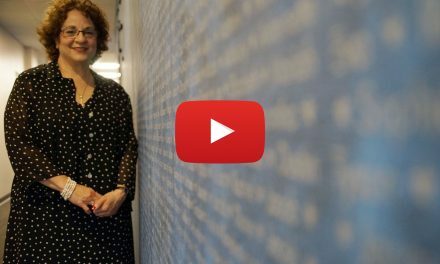 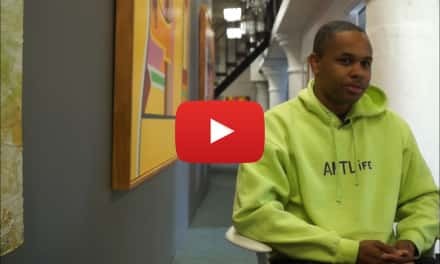 This video was recorded live from the windy rooftop of the Milwaukee School of Engineering‘s Grohmann Tower, along with supplemental photos that captured the historical moment.